Right before the DL Show last night, I was turned onto a wallpaper collection called nowPaper that is available on Google Play. 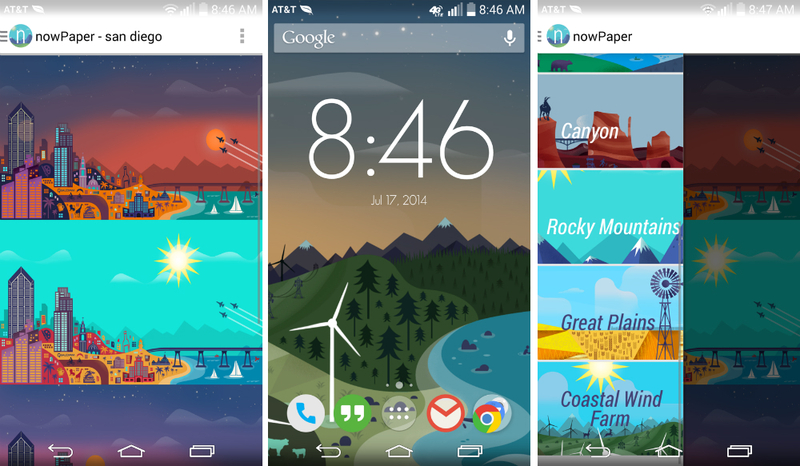 If you have ever opened Google Now on your phone or tablet, then the inspired artwork should look quite familiar, featuring well-known landscapes and cityscapes from across North America. Each area featured in the app has multiple papers, allowing you to choose the time of day you would like to have on your device. There is dawn, afternoon, evening, and night. Even cooler, the app has a newly built-in Muzei plugin, allowing you to switch wallpapers automatically depending on what time it is. If it’s 12 in the afternoon outside, you will see a shiny bright wallpaper on your phone. If it’s 10pm and getting late, you will see the nighttime wallpaper. The artist responsible for the wallpapers states that he has a lot more cities coming, including San Francisco. Here’s hoping he also has time for Portland, OR. The app costs just $0.99 on Google Play.